In this tutorial I show you how to recreate this famous painting in miniature for your dolls house or miniature collection. Norbert Goeneutte was born in Paris in 1854. Aged around 17 years old he joined the art school Ecole des Beaux-Arts in 1872, where he studied for 4 years, learning landscape painting, etching and engraving. He particularly enjoyed etching and engraving, and became a book illustrator during his career. 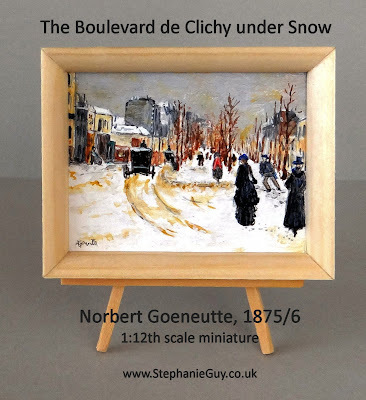 Gounuette painted this piece, The Boulevard de Clichy under Snow 1876, whilst still attending the art school and in 1876 he placed it in his first exhibition at the world famous Salon, the official art exhibition of the Académie des Beaux-Arts. Throughout his career he continued to exhibit with the Salon, declining to join his contemporaries and acquaintances the impressionists Manet, Renoir and Degas who had set up an alternative exhibition. We can see some impressionist influences in the way that Goeneutte has painted the snow in this piece. Japonism, the influence of Japanese prints upon Western art, was popular among French artists at this time and there are definite Japanese print influences in this piece: the off centre composition, the lack of shadows and the dark almost floating figures in the foreground are examples of this. 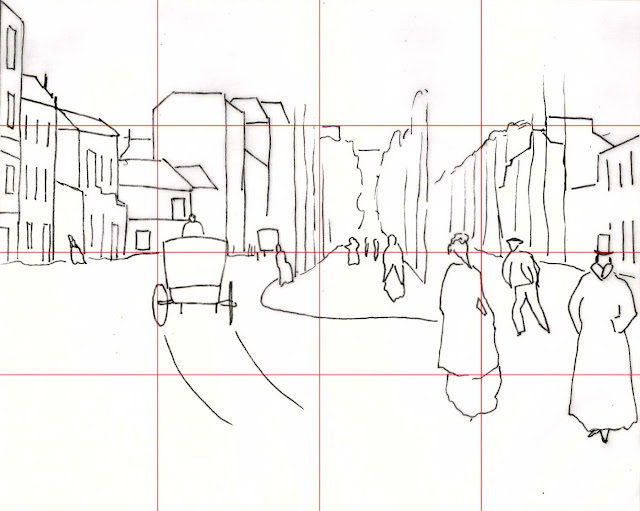 Perspective-wise, notice how all of the heads are more or less on one level – we get the impression of distance by placing the feet of the distant (and therefore smaller) people higher up the paper. This is a neat trick to remember when you’re painting a street scene. The Boulevard de Clichy under Snow, 1876, is painted in oils on canvas. To recreate the same look in miniature we need a support that will give the impression of a miniature canvas but without the weave of the canvas dominating the finished painting. I recommend using off-cuts of smooth mount board, easily obtained from a framing shop - if you ask nicely the proprietor will probably give you his off-cuts for free. Goeneutte’s painting measures 60 x 73cm. To find how big yours needs to be simply divide these measurements by the scale you're working in. On a 1:12th scale, dividing by 12 will give us = 5 x 6.1cm; for 1:16th we need to divide by 16 to get 3.75 x 4.58cm, for 1:24th divide by 24 giving 2.5 x 3.1cm. Using your steel rule and craft knife, cut out the mount board to the correct size. If you want to frame your finished piece add at least a couple of millimetres all round to allow for mounting into the frame. I did not do this and lost a small amount of the painting at the end when I decided to frame it after all. Apply 2 coats of gesso with a flat brush to prepare your canvas. This will stop your paints from soaking straight into the board. You'll need to leave it for at least a day to thoroughly dry. The drawing for this piece involves a number of straight lines. I usually banish rulers as they can make buildings look stiff and unnatural, however on this scale the brush strokes will soften those edges nicely so if you feel more comfortable with a ruler, go right ahead. There are a lot of greys in this painting, mostly made up of French Ultramarine, Burnt Umber and Tinting White. Squeeze out a small amount of these three colours, with an extra squeeze of Tinting White. Mix equal quantities of Burnt Umber and French Ultramarine , then add Tinting White until you have a mid grey. Now add a small size 00 brush load of the mid grey to one of your Tinting White blobs and mix to a pale grey. Use the pale grey to paint in the sky using small brush strokes. Allow this to dry and then repeat with both the pale grey and tiny amounts of the mid grey, using a dry soft flat number 4 brush to blend. In particular, there are slightly darker areas around the right hand top corner edges. Paint the grey buildings using your mid grey. Colours get paler the further away from them you are as the atmosphere interferes with the light particles - adding pale grey to your mid grey as you recede into the distance gives the illusion of depth. Wet the small flat brush, dab it dry, and use it to tidy up the straight edges by mopping up from the sky-side. Providing the previous layer is dry you can use this technique wherever you go outside straight lines and need to tidy them up. Squeeze out a little Yellow Ochre into your palette. Make three small dots of Tinting White and add some of the Yellow Ochre to the first one. Add some of this new mix to the next dot of Tinting White and so on until you have three different strengths of Yellow Ochre/Tinting White. Use this to paint the yellow and cream buildings, again getting paler as the painting recedes. Squeeze out a touch of Burnt Sienna and use this to add in the reddish-brown sections of the buildings. Glaze over some of the mid grey buildings to add brown tones. Mix in some Tinting White and add lowlights to all of the cream buildings. This makes them look a little dirty and more lifelike. Next, using a dry brush, pick up the tiniest amount of Burnt Sienna, dab on a tissue and then using your brush almost horizontal to the page, gently brush over the tree area to give a foliage effect. Mix equal quantities of Ultramarine and Burnt Umber, this will give you a very dark almost black colour. Add a tiny amount of water to get a single cream consistency and paint in the windows on all of the buildings, starting from the top of the window and moving your brush down each time. This creates shadows and depth. Add more water the further away you get to emphasise that feeling of depth. Next, paint under the eaves of the buildings to add shadows. Before we start on the snow we need to warm up the greys a little. With the side of a dry brush, take some Yellow Ochre/Tinting White mix and wipe it on a piece of paper or your palette to make sure that there are no blobs. Then use the side of your brush to gently add some warm yellow highlights to the sky and the grey buildings. Before we start on the snow, take a white tea towel and drop it in an untidy heap on a clean table. Squint at it and observe how there are some hard shadow edges and some soft shadow edges that blend away to nothing. That’s all that snow is – a large white tea towel dropped over the landscape! 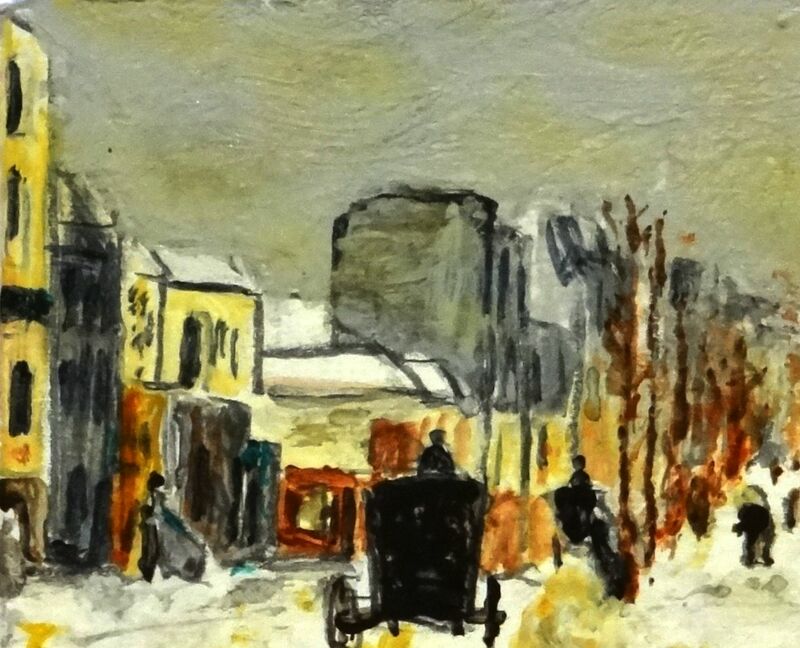 The colours in the shadows of the snow are simply a reflection of the surrounding buildings and sky, so using those same pale greys and pale Yellow Ochre/Tinting White mix and a dry brush, scrape over a tiny area of snow. Use a clean small damp brush to blend out to nothing on one side or the other. Without having Geoneutte’s actual painting in front of you there’s no way you will be able to do this exactly as he did on this scale, so just have fun and go your own way. Repeat this all over your snow to get the desired effect. Remember to leave lots of pure white areas where the snow is glistening. Next we need to add in the harder shadows and dirt that is showing through. 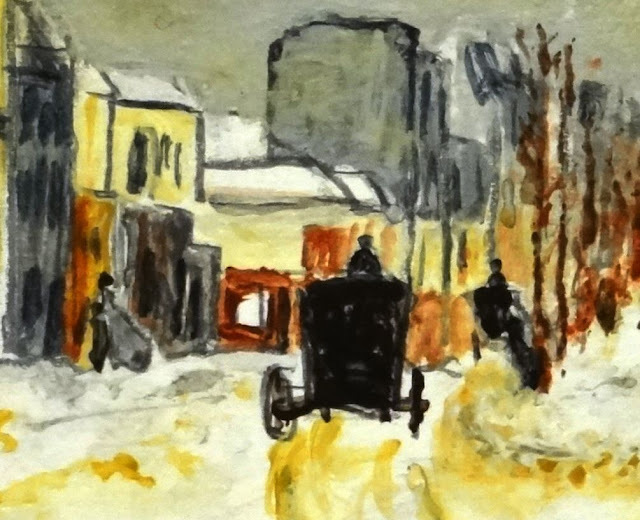 Use Yellow Ochre and Titanium White separately to add the dark shadows edging the road in the middle of the painting. Firstly paint Yellow Ochre over the pencil line and then blend with the Tinting White by dotting and dabbing randomly along the line. Use the same technique to paint in the tracks left by the gig. With hardly any paint on your brush, add in the lines to the right of the building on the left. Finally, dot in the foot prints around the people in the snow. Mix a touch of French Ultramarine with Burnt Umber to darken the brown and paint the carriages. Add a little water and underpaint the dark clothing on the people, leaving the top half of the central lady white. 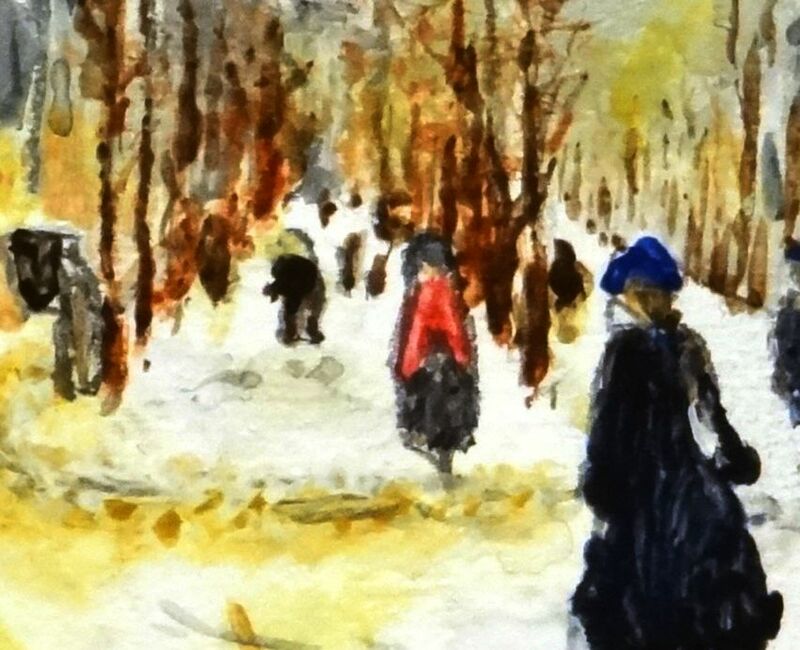 The people in the background are simple dashes and dots – don’t try to add in details here. In three stages, darken the dress on the largest lady paying attention to the ruffles by dotting in darks randomly along the ruffle line. Darken the right hand side of her left arm and the bottom of the dress using small vertical lines to give a feeling of fabric. Pick up some Titanium White, which is your most opaque white, and paint in the little triangle between her right arm and body. Paint her hat using your darkest mix. Mix a touch of Yellow Ochre, Crimson and Tinting White until you have a Caucasian skin colour, and paint in her head. She is walking away from us so we need to add her hair in Burnt Umber to finish her off. Repeat this process with the men on her right. Take a dry brush with a touch of Yellow Ochre and lightly brush over all three background tree areas. If you have some clear painting medium then add this to some Burnt Sienna (if you don’t have painting medium just add clean water) until you have an inky consistency. Use this to paint the tree trunks and a few branches. Trees don’t usually grow standing to attention so use a very gentle wiggly motion and lift your brush off the paper occasionally. Add a touch of Burnt Umber to the Burnt Sienna mix and repeat. Try to keep the first 2 trees in each row distinct from each other. The rest of the trees can merge together. With a clean slightly damp brush go along the bottom of each row of trees and smudge them – this will add shadows and place them firmly on the ground. Turning to the townsfolk in the middle distance, paint the lady’s red coat in a weak Crimson. Allow your pencil lines to show through on the arms, this is where Goeneutte outlined in a dark colour. Use your skin tone to paint in her face, and finally dot in her hat with the Burnt Umber/French Ultramarine mix. The person to the red lady’s left has a Yellow Ochre hat so we can dot this in, and she has a slightly darker top half to bottom half – simply dot over the top half with Burnt Umber/French Ultramarine. The person to the right of the central trees is almost the same colour as the trees. Use Yellow Ochre/Tinting White for the bottom third and the Burnt Umber/Burnt Sienna mix for the top two thirds. There are a couple embracing on the left hand side by the building. Paint a straight line for the man using Burnt Umber/French Ultramarine, and then paint the lady in your mid grey mix. Add a tiny white dot to represent an arm. Next we’ll add the details on the buildings. Dab a tiny amount of Pthalo Green into your palette and pick up the smallest touch you can. Paint over the grey line on the first building on the left. Add a dot to the back of the embracing lady. The very last building before the second set of buildings is also green, so paint this one in too. Paint the lit window on the next building along in Yellow Ochre/Tinting White and when this is dry add in a cross to represent the window frame. Add in the frame for the upper window, both of these using your thinned Burnt Sienna/Burnt Umber mix. Go back to the first building on the left and paint the window display with Burnt Umber and Burnt Umber/Tinting White mix. Run along the bottom edge of all the buildings with a very weak Burnt Umber mix to give a merest hint of a shadow in the snow. We’re going to paint the snowy roofs next, so firstly, change your water! Squeeze out some opaque Titanium White and move around the painting adding snow on the roof tops, carriage tops and also dot and dab some pure white around the ground taking care not to cover your shadows. Next, pick up some Burnt Umber/French Ultramarine and paint slight lines under the eaves of the roofs where shadows are cast. Using the same mix, paint in the chimneys and a very slight horizontal shadow on the larger of the roofs. Finally, we need to sign the painting. Practice Goeneutte’s signature on a scrap of paper before signing in the bottom left hand corner. Goeneutte used paint but on this scale that would be incredibly difficult so I recommend using a very sharp pencil. Wash your brush in a series of three water pots, beginning in the dirtiest water pot and working towards the cleanest. You should find that this means that your clean water will stay clean for longer, you will need to change water less often and your colours will not get muddy. Dry your brush on an old rag or piece of kitchen towel before picking up fresh paint. If the paint on the brush becomes blobby, clean it and pick up more paint with the tip of the brush. For very fine brush work roll the loaded brush against your palette or a scrap of paper until the bristles come to a fine point.